Little Man flying his kite, originally uploaded by Craftydiddl. 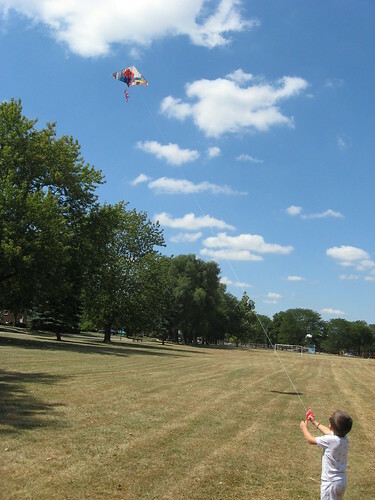 Last weekend Little Man flew his kite for the first time, he had good time. I am looking forward to another windy day so we can do it again. Things are still moving along over here but nothing to show. Just imagine everything with some more rows. That’s one of tha bad thing about having so many projects going, You work a little on them all and progress is slow. I have to say of all of them Little Man’s Alligator scarf is my favorite. It’s turning out super cute. I love the bumps on the back and the pattern is well written. But i do think i may have to make the bosy a little longer i am halfway through and it doesn’t seem like it will be long enough. Hubby has been off on a golf trip since Thursday and will be coming back tomorrow. Little Man and I have just been hangin out, goign to stores, we got some Thai food yesterday and went to the candy store and got some treats. Both were delish. I love thai food, well really i should say i love one dish Pad Thai and only because that’s all i have ever gotten when i went, i am sure the other stuff is good too. Little Man got Bangkok Chicken which was rice and chicken cut up small and lightly breaded and then a sweet and sour sauce on it. That was really good as well. Today i finally folded and put away my laundry and cleaned up the kitchen. Then we made Fairy Cakes from a new book i got this week, The Gentle Art of Domesticity by Jane Brocket. The book is Beautiful!!! There are some recipes in it and just her thoughts of things around us and how she applies it to her many crafts and life. I haven’t read the whole book yet so this is just a small overview. but most importantly are the pictures. They are gorgeous and full of color and inspiration. Just my kind of bright happy colors. I have already been inspired for a friendship bracelet and her quilts make me want to make quilts just and bright and beautiful. She does have lots of links and info in the back of the book and while i would have enjoyed the patterns for some of the beautiful stuff in there i don’t miss it as much as i thought i would. She does list where the patterns are from at the end of the book or whether it is one of hers so that helps for the ones that are not hers. I don’t think i will ever be able to stop looking at the pictures, art and crafty, domestic goodness in this book. It’s totally worth checking out and you can stop over at her blog as well. Anyway our fairy cakes are cooling and then some frosting will go on them and maybe a couple M&M’s from the candy store. I will definitely share the outcome with you. There is nothing more fun than flying a kite on a windy day. Little man looks like a pro. I can’t wait to see your fairy cakes. I bet that book is excellent. love Jane’s blog. I cannot remember me flying the kite for the last time, I really must try it next Spring, because I don’t think we will have a good weather for it this year. Cold and wet Autumn seems to be here to stay for good.